As National Apprenticeship Week 2017 draws to a close we wanted to take a few moments to look back at some of the biggest events and news stories. The increasing profile of Degree Apprenticeships meant that events experienced record attendances and the week provided a great platform for high-profile news announcements and also the publication of new research. Here at Manchester Met are week started with an appeal to employers to engage with degree apprenticeships and take advantage of the opportunities to develop higher-level skills within their organisations. Our key message was ‘there has never been a better time to take on apprentices’. The centrepiece of the week for the University was our Apprenticeship Open Evening on Tuesday 7 March, which brought together employers, academics and potential apprentices. 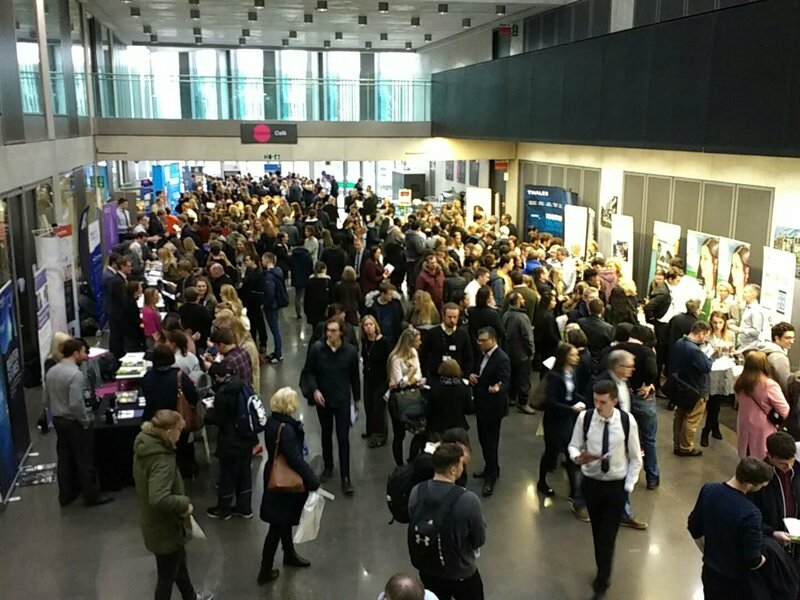 Our annual flagship event was attended by more than 500 people and there was representation from 25 employers, including many businesses recruiting degree apprentices for the first time. Several of the employers used the event to launch their national recruitment campaigns and we will be disseminating more information to attendees in the coming days and weeks. We were also out and about at the Barclays Apprenticeships Fair on Wednesday, again talking to people about the opportunities of Degree Apprenticeship with organisations, such as Barclays, who have chosen to partner with Manchester Met. The University was also represented at the Digital Leaders, Digital Apprentices and the opportunities for the North West Digital Economy, Seminar. Dr Robin Johnson, programme lead for the Digital & Technology Solutions Degree Apprenticeship, spoke of the contribution apprentices are already making to organisations and how they too, can benefit from the impact of apprentices. We were delighted to receive the backing of two leading figures in the UK HE sector for the work we are doing on degree apprenticeships. Nicola Turner, Head of Skills at the Higher Education Funding Council for England (HEFCE), held up Manchester Met as an institution other HEIs could learn from and praised our pioneering approach. The university was also recently visited by a delegation from the Department for Education and Chris Brockhurst, Head of Apprenticeship Strategy, was impressed by the impact of degree apprenticeships and also praised the university for its institution-wide approach. At the heart of every apprenticeship, is an individual apprentice learner, and their experience is the most important outcome of any programme. We were delighted that three of our apprentices on took part in blogs to share their experiences and explain in greater detail, what being a Degree Apprentice is like. We have many more apprentice stories featured on our website. While Manchester Met are pioneering the development and delivery of Degree Apprenticeships, their growth depends on greater adoption from both universities and UK businesses. Universities UK published a report, which showed that the momentum behind degree apprenticeships is growing and it is expected that nearly all new degree apprenticeship standards will be delivered. There has also been widespread engagement by HEIs with the Trailblazer process. It identifies the challenges to HEIs, which overcome should see continued growth of degree apprenticeship provision. However, this is only one part of the equation. Research this week by the website Success at Schools showed that, although there is a huge appetite for Degree Apprenticeships from school and college leavers, with over 70 per cent saying they would consider a programme, there is still a lack of employer engagement. Of the 19,442 vacancies on the government’s search tool, only 74 are for Degree Apprenticeships. Although this should rise as we enter the peak recruitment months of March to June, it still illustrates the challenges faced by universities in engaging with employers to create new opportunities. The introduction of the Levy in May could also have a positive impact. Only time will tell, but we are working very hard to encourage employers of the benefits of taking on apprentices. I hope that is a useful round-up of #NAW2017 and if you are interested in studying an apprenticeship or employing apprentices, please contact us and we'll be happy to help.